We Episcopalians are a liturgized people. Unlike our Protestant friends, we are not a confessional church; nor do we possess a majesterium, pronouncing definitive moral judgements for us from on high. What we have, in essence, is our worship. Lex orandi Lex credendi. A belief which, loosely translated means that praying shapes believing. In other words, how we worship, shapes what we believe. Sometimes, this can be taken quite literally. 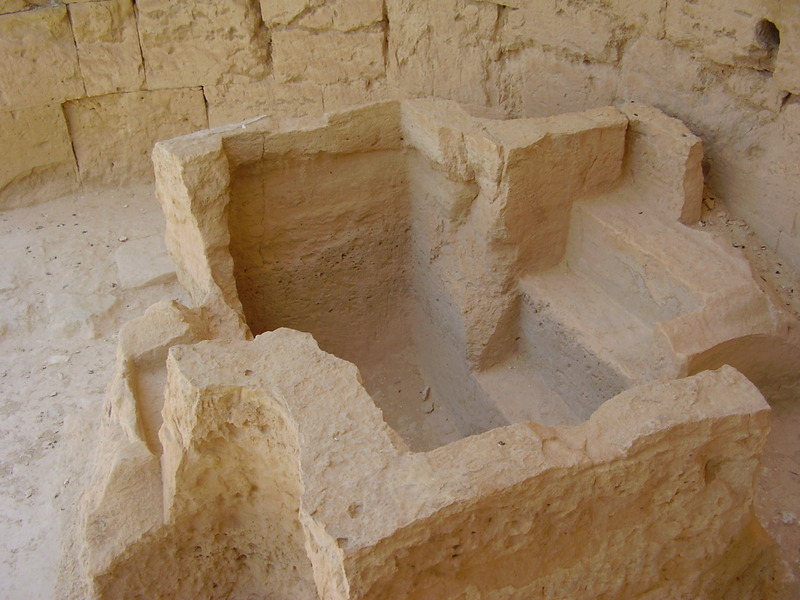 In the ruins of a fourth century Christian Church, at Shivta in the Negev desert in Israel, there is a cross-shaped baptismal font—whose picture you can see on the front of your bulletin. This is what is referred to as a tomb font. It’s a truly wonderful thing. In fact, in many modern churches you can find fonts very similar to this in shape—proof that tradition, if lived into and understood, continues to breathe life into God’s people. Allow me to explain. We begin with the reading appointed for today from the Wisdom of Solomon. “God did not make death. And he does not delight in the death of the living. For he created all things so that they might exist…(the reading goes on to say) God created us for incorruption and made us in the image of his own eternity, but through the devil’s envy death entered the world, and those who belong to his company experience it.” Death, then, is an aberration—it is not reflective of the will of God. God desires for us something different. The New Testament teaches us that it is through the incarnation of Jesus, that the solution to the problem of death can be found. The solution God designed is found specifically in the Son of God: Jesus, and is summed up neatly in the fifth chapter of St. Paul’s letter to the Romans where he states: “But God proves his loves for us in that while we were yet sinners, Christ died for us.” But the power of words is increased manifold when accompanied by art and form to convey depth of meaning. And this is where liturgy comes to the fore. To read or say something is one thing—to see and participate in this truth, is another. The Sacrament of Holy Baptism is the means by which God’s grace is communicated to humanity. On one level, it is a means by which people, such as Georgia Archibald are welcomed into the family of God. It is also a means of spiritual cleansing and assurance of God’s love and promise of eternal life. Listen to some of the words of the prayer said during the Thanksgiving over the Water. As we ask God to bless the water we pray: “We thank you, Almighty God, for the water of Baptism. In it we are buried with Christ in his death. By it we share in his resurrection. Through it we are reborn by the Holy Spirit.” And this is what brings me to the tomb font on the front of your bulletin this morning. Take a moment and travel back in time. It is the late 300’s, and you are a resident of Shivta, a small community near Beersheba in modern-day Israel. You are a Nabataen, a member of an Arab tribe. The Emperor Constantine gained power several years past and Byzantine culture has gained a foothold in your area, which is located on a trade route. While there is still no official Bible as of yet, you eagerly listen to letters and a few of the Gospels read to members of your community and you decide that this faith, speaking of love, grace, hope and even sacrifice, is calling for you to put away your family idols. You have decided that you would like to be baptized. You spend a year (or more) as a catechumen (a person preparing for baptism). On Sunday mornings you arrive at worship to listen to the teachings and sermon, and, as is customary for all members of the catechumenate, such as yourself, you leave worship before the Holy Mystery is celebrated (the Eucharist). Once the community of the faithful is satisfied that your lifestyle matches with what you profess, you are ready to be baptized. You come to church, and are faced with The Examination, not much changed from The Examination of the Candidate for Holy Baptism that is found on page 302 of your Book of Common Prayer. You are asked if you will turn your back on Satan, evil and sin and turn your life over to Christ’s grace and love. Then you are brought to the font. And this is no ordinary font. You find yourself standing at the foot of the cross, and from there you descend into the waters of baptism. In essence, you die. The priest immerses you not once, but three times. Three times you are plunged under water and three times hands lift you up to new life—and it isn’t lost on you that Jesus too descended into the realm of the dead, and he stayed there three days, and on the third day he too, arose. And then, you are taken by the hand, and you walk out of the font, not on the same side on which you entered, but on the other side. For you have been reborn, made a new creation in Christ. And then you are handed a white gown to put on, symbolizing your new birth. And now, and only now, are you admitted to the Holy Mysteries, the Eucharist, to receive the sacrament of the Body and Blood of the Lord. In truth, the sacrament of Holy Baptism hasn’t changed from the time of those first centuries to our own. As Georgia Archibald is welcomed into the family of faith, she joins a household of believers the world over for generations that goes back well over a millennium. People from all walks of life who have chosen to make a commitment to Christ, and to live into the promises of God. That’s part of a tradition. But tradition, if it is lived well, is not some dusty thing of the past, it is part of a living faith. And it becomes real to us not through photos in an album or through memories; but by living into those promises on a daily basis—promises which, as I mentioned earlier, are thousands of years old. The Christian faith lives, and it continues to thrive not because of traditionalism—the dead faith of the living; but because it is tradition—the shared experiences of people who have encountered the Living God—from the leader of the synagogue who, we discovered in today’s Gospel, called upon Jesus to heal his child; to the hundreds, if not thousands, of people who entered the Christian faith through the font at Shivta to those here at St. Paul’s, who have come to know their Savior through word, song and sacrament in the Episcopal Church. It is this faith and experience, this hope and promise that is offered to Georgia today, and should she choose to live into it, my hope is that it will bring her happiness, purpose, joy and fulfillment in the years to come. In Jesus’ name. Amen.